Collector's Weekly is an unlikely place for a fascinating article about boating, but they recently ran a piece alluring entitled Love Boats: The Delightfully Sinful History of Canoes. It concentrates on the US but there was a similar phenomenon in Britain. It seems that before the back seats of beat-up Chevrolets became available to the common man and his girl in search of well-padded privacy, canoes were the thing. Canoes would be primped for the purposes of romance, with cushions, picnic baskets and even phonographs. Just like the shag wagons of later years but more stylish. In Britain, it wasn't just canoes. Thames skiffs and punts were notoriously used for seduction. Thames-side towns flourished on the popularity of hire boats taken out by couples. Maidenhead in particular became a by-word for the dirty weekend - the famous scene in Kind Hearts and Coronets where Dennis Price cuts the painter of the punt where Alec Guinness and Anne Valery are fornicating to send them over the weir was set in Maidenhead. "I was sorry about the girl, but found some relief in the reflection that she had presumably during the weekend already undergone a fate worse than death," he observed, in one of the breathtakingly brutal quips that make the film so blackly funny. 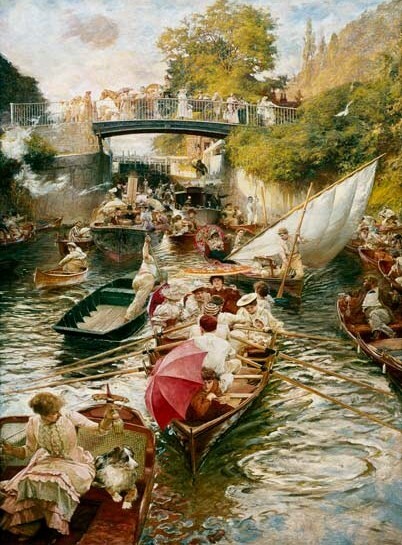 It is tempting to read all sorts of shenanigans into the famous picture of Boulter's Lock by E.J. Gregory but he used his family for most of the figures so presumably it is not a satire on Victorian hypocrisy. One of my favorite Spoonerisms is, "Punts are not for kissing in." Humm I'm guessing an amorous liaison in Snarleyow might be challenging, or is there more to a sliding seat than I know about? The title of this blog is starting to make more sense.